The newest tool in the fight against opioid overdoses is an inexpensive test strip that can help heroin users detect a potentially deadly contaminant in their drugs. Government agencies have begun paying for test strips and providing them to needle-exchange programs. NEW YORK (AP) — The newest tool in the fight against opioid overdoses is an inexpensive test strip that can help heroin users detect a potentially deadly contaminant in their drugs. Sales of fentanyl test strips have exploded as a growing number of overdose-prevention programs hand them out to people who use illicit drugs. Though they weren’t designed for it, the test strips can signal the presence of fentanyl in illicit drugs. Some health officials question their accuracy, but they have proven to be so popular that some programs can’t get enough to satisfy demand. “As soon as I hit the street with them, they’re gone,” said Washington, D.C., needle-exchange outreach worker Maurice Abbey-Bey. The U.S. is in the midst of the deadliest drug overdose epidemic in its history, and it’s been getting worse. More than 70,000 Americans died of drug overdoses last year, a 10 percent increase from the year before, according to preliminary U.S. government numbers. Growing numbers of recent deaths have been attributed to the painkiller fentanyl and fentanyl-like drugs. The drugs are far more potent than heroin, but they are relatively cheap and increasingly have been cut by suppliers into street drugs without buyers’ knowledge. The strips sell for $1 each. Costs can quickly add up for groups distributing them because some people use drugs four or five times a day. Government agencies have begun paying for the test strips and providing them to needle-exchange programs. The state health department in California started last year, and the health departments in some cities — including Philadelphia and Columbus, Ohio — have started since then. But some other health agencies have declined, citing uneasiness with the tests’ accuracy or doubt about whether someone would actually throw away contaminated dope. There’s been little research on whether tests strips are an effective weapon against the overdose epidemic, said Catherine McGowan, an assistant professor at the London School of Hygiene and Tropical Medicine. The tests strips are intended for testing the urine of patients who are legally prescribed fentanyl for pain, as a way for doctors to make sure they are taking the drug, said Iqbal Sunderani, the chief executive of BTNX, the Canadian company that is a main producer of the strips. The strips are licensed for that purpose — and only that purpose — in Canada. They are not licensed for any use in the United States. In 2016, a Canadian doctor devised a new way to apply them: by dipping them into the residue of “cooker” cups that heroin users employ to prepare their injections. A government-sanctioned facility in Vancouver that allows people to use drugs under medical supervision started offering the tests two years ago. Last year, health officials there released results of a study of more than 1,000 drug checks. More than 80 percent of heroin and crystal meth samples tested positive for fentanyl, as did 40 percent of cocaine samples. Drug users who got a positive result were 10 times more likely to lower their dose, the study found. The Vancouver results drew attention. In October 2016, St. Ann’s Corner of Harm Reduction in New York City became one of the first U.S. programs to offer them. It was important to take new steps, said Van Asher, the Bronx organization’s syringe access program manager. “We’re losing people at a greater rate than we were at the height of HIV” in the early 1990s, he said. A few small studies have shown a high willingness by drug users to use the tests. Perhaps the most important was a study by researchers at Johns Hopkins University and Brown University, which was not published in a peer-reviewed journal but was released to the public in February. It concluded the test strips were highly accurate. BTNX doesn’t recommend the strips for testing illicit drugs, but Sunderani, the company’s president, knows it has become the main driver of sales. It sold 117,000 tests in the U.S. last year. So far this year it has already sold more than 410,000, he said. A growing list of government agencies in Canada and the United States are paying for the strips, but others have been reluctant. Dr. Elinore McCance-Katz, a point person in the Trump administration’s response to the nation’s opioid epidemic, said she doubts positive test results deter people from shooting up. “I don’t think they’re going to be using fentanyl test strips and say ‘Oh gee, this is positive for fentanyl? I better go find something else,'” said McCance-Katz, who heads the U.S. Substance Abuse and Mental Health Services Administration. Strip proponents agree: Most heroin addicts won’t walk away from their drugs, no matter what a test result says. 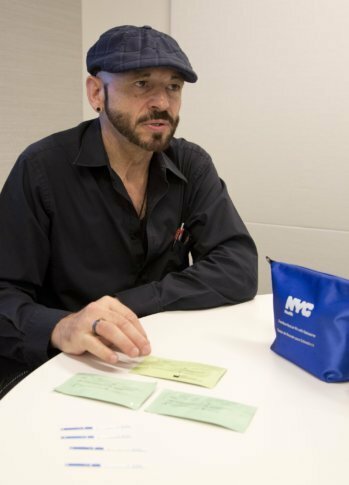 “In the whole time I’ve been doing this, I’ve had only three people throw out positive samples,” said Tino Fuentes, an overdose-prevention outreach worker who has become a kind of Johnny Appleseed in the U.S. for test strips, promoting and handing them out in multiple cities. But Fuentes and others say the strips can nevertheless get people to reduce their chance of a fatal overdose, for example by taking smaller doses or taking drugs in the presence of someone who has an overdose-reversal drug. Fuentes said he was delighted when he learned of two people who recently stopped using the strips because they decided to treat every dose as contaminated and to take precautions every time. “The ideal thing is we no longer need strips because people are using safely,” he said. Some health officials worry that there’s a chance that the test strips will fail to detect certain contaminants. Late last year, Canada’s national health agency said a preliminary analysis of 70 samples found three in which the test failed to detect fentanyl or fentanyl analogs. A follow-up analysis by Health Canada found BTNX strips produced five false negatives among 364 samples tested. In Washington, D.C., the health department has declined to pay for them or endorse their use “based on the high likelihood of false negatives,” said department official Michael Kharfen. Some outreach workers understand the caution, noting for example the test strips detect the presence of fentanyl, but not how much. “It could be 2 percent or 98 percent. And the difference will kill you,” said Reilly Glasgow, who works at New York City’s Lower East Side Harm Reduction Center, which is part of an organization called the Alliance for Positive Change. But he said his program was finally persuaded to offer the strips because too many people didn’t believe any fentanyl could be in their drugs. “They needed proof,” he said. The man said he’s been injecting heroin since 1992 and spoke to The Associated Press on condition of anonymity because he didn’t want to jeopardize his ability to get housing, to keep his place in a treatment program or to land a job. One day last month, he demonstrated how the test strips worked on a packet of heroin powder stamped with a blue devil on the side, which he bought from his regular dealer. Inside a Brooklyn apartment, he shook the powder into a tiny cup, added water, and drew up the resulting brown liquid into a syringe. Then he set the needle aside, added a few drops of water to what was left in the cup, and swished it around. Then he dipped the end of a test strip in to absorb the water and drug residue. In seconds, a red line appeared. “There’s supposed to be two. There is no second line, so this contains fentanyl,” he said. Then he emptied the syringe into a vein on the back of his right hand, his eyes glazing as the drug took effect. A friend, Jessie Kruger, arrived a short time later. Kruger said she used to inject heroin but quit more than a year ago after a scary health episode.